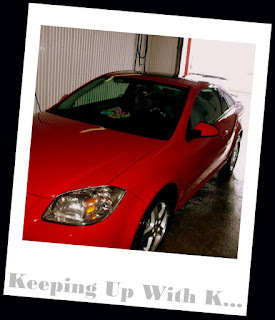 Keeping Up With K...: Weekend Update . . .
Today I am taking part in the Weekend Update Blog Hop with Dana, Leeann and Sami for the first time! Friday night I ate leftover Halloween candy and watched episodes from the 1st season of Revenge on Netflix with my sister and Graycie. (I have seen them all but my sister hadn't . . . as much as I LOVE Revenge I may haven fallen asleep on her. . . whoops) At least I fell asleep before I could eat any more candy . . . In the afternoon my Mom asked me to help her get a Pinterest account. When I was setting it up this is exactly what she asked me 'Do you have to have THE Facebook to get Pinterest?'. I can't even make this stuff up . . .
8500 smackaroos... Too bad I have to be responsible . . . A trip to Vegas is much needed . . . I think I am the only person who hasn't seen Revenge. I will see if I can catch up online. And congrats on selling your car... Spend that money, girlfriend! I was rolling about your mom's comment about THE FB... That is sooo my mom also! She thinks the world revolves around FB and all things are linked to it! Celebrity Sightings . . .
25 Days . . . The Start of Winter on the Prairies . . .
Say My Name Link Up . . .